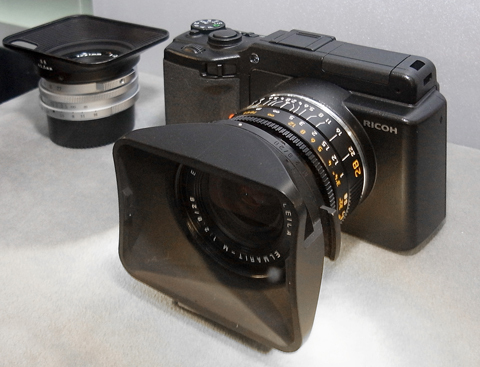 The proposed Leica-M mount module for Ricoh?s GXR system has created quite a stir, and rightly so. It was Panasonic?s very early proclamation of a Leica adapter that got so many ?serious? photographers interested in its G series Micro Four Thirds cameras from day one, and we had pointed this out to Ricoh shortly after the GXR launch. Amateur Photographer (AP) was fortunate to have the chance to interview Saiki Kazunobu, and Keita Hashizume (general manager and manager for Ricoh?s European camera business) about the new M-mount module just before the unit went on display at the CP+ show in Japan. Although the unit and camera are being shown accompanied by the company?s famous GR21 and GR28 lenses Saiki says the company has no plans to restart production of these interchangeable lenses which is a shame. However Ricoh has confirmed to AP will be introducing an adapter to convert L39 screw-mount optics to the M mount camera unit. It is interesting that the company has chosen to use a focal plane shutter in its GXR Lens Mount Unit. Other manufacturers of compact system cameras have opted for shutter-less designs that rely on sensor read times instead of physical shutters. In using a focal plane shutter Ricoh seems to be making life difficult for itself. Saiki explained, though, that a focal plane shutter was chosen because it will produce far more accurate shutter speeds. Also, with a shutter covering the sensor the unit complies more readily with the dust-free ideals of the GXR system. Having the sensor active only when a picture is being taken will also help keep image noise to a minimum, explained Saiki, as the sensor will be cooler and will be completely discharged before the exposure takes place ? something not always possible with a sensor that is constantly receiving information. The use of a focal plane shutter though will require a new solution for live view operation. The shutter is not exposed and so can not relay information to the rear LCD screen. Mr Saiki told AP that Ricoh does have a solution for this, but he would not be drawn on what it was. He would say, however, that it would not involve a time consuming process and that the camera would remain very effective as a tool for street photographers. The inclusion of a focal plane shutter has also made the unit somewhat larger than we expected, though some extension of the mount is necessary to maintain the back focus distance for the 35mm/full frame-designed Leica lenses. The bulk of the left-hand side however will actually help balance the GXR unit when used with M lenses that will inevitably be heavier than current GXR lens units, Saiki said. The finished product is still some time off, and between now and Autumn Ricoh has plenty to do to perfect this module. We look forward to testing it then.